At my house, Christmas usually shows up during summer. The traditional unwrapping of colorful boxes filled with vintage Christmas tablecloths, exciting packages arriving from ebay and etsy (more vintage tablecloths) and the popular get-in-the-holiday-sewing-spirit-when-it's-hotter-inside-the-house-than-it-is-outside (fyi - if you're planning to move to the PNW, do not be led astray by those who say 'you don't really need air conditioning here' because 'you definitely do') all starts sometime in late June. That's when I'm still relaxed about everything in my sparkly dream-world scenario where I calmly craft an enormous, highly creative and well-made collection of items to sell on ebay, etsy, and at shows. 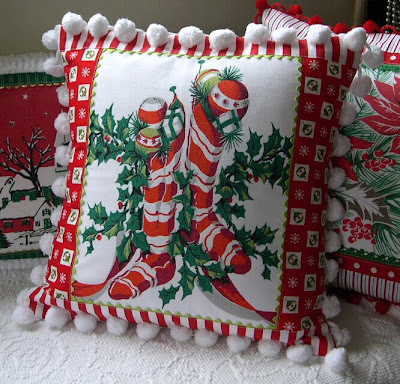 I do like sewing vintage Christmas because it's so in-your-face...red & green everything, clashing all over the place. 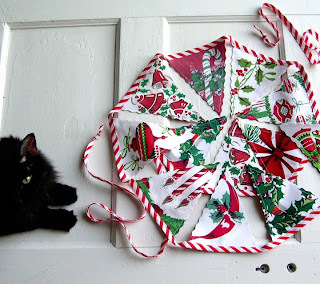 That's Vintage Cat, helping with some photo styling. More about her to come. Also, she has both eyes in case you're wondering. Hi Amy, Welcome to the wonderful world of blogging. 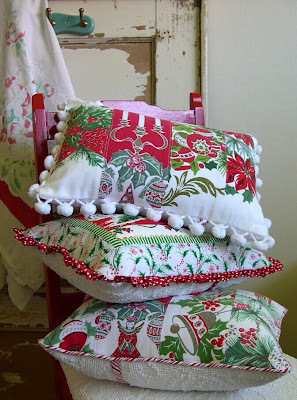 Vintage linens repurposed, I think that I am going to like it here. At the *mall*, you say? Somehow I seriously doubt it. And that flaky door there in the background - I love it. And the cat. Yes, the cat is cute, too. Welcome to blogland. It's an interesting place.